Appliance repair is something that we hope our neighbors in Dallas, Texas will not need in the near future. Few things are as frustrating as not having a working washing machine and not having clean clothes, or worse yet, water damage due to a leaky washer. Maybe your washer is fine, but your fridge has decided that it has had enough and you are left with hundreds of dollars of spoiled food. 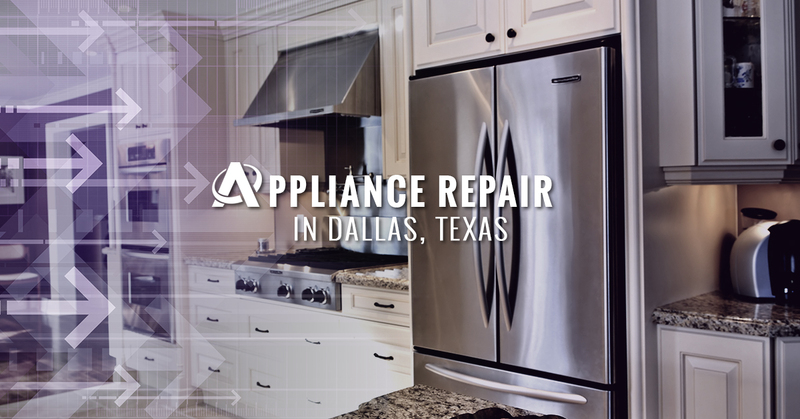 Our appliance repair service experts would love to help mitigate as much damage and destruction as possible in your Dallas-area home with our instant same-day appliance repair service. Below are some of the repair services that we offer to our clients in the Dallas, Texas area. As mentioned above, nothing is as bad as not having a working fridge and coming home to a fridge and freezer full of spoiled food. If you think that your fridge is acting funny, call us; if your fridge has completely stopped working, call us. Our appliance repair service specialists can give your refrigerator the love and care that it needs to keep working or continue working once again. When you call Appliance Champion, you can expect appliance repair that will have your fridge working like new, a service that isn’t overpriced, and a repair service that protects your warranty. Below are the main brands that we service. Learn more about our refrigerator repair and contact us for an appointment. Not having a working washer isn’t the worst thing in the world, except when it’s leaking all over your floors and you barely have any clean clothes to wear. We at Appliance Champion know how frustrating it can be to have a washer that has completely quit working, keeps making an odd, worrisome noise, or doesn’t seem to be running like it used to. Our appliance repair specialists can assist with maintenance issues as well as large repairs. When we repair your washer, you can rest assured that your washer’s warranty is protected, that we are actually fixing the problem, and that you won’t be charged a penny over what is needed. We provide washer repair to the main brands listed below. Contact us for a same day appointment! Many of us have been there when we have to be out the door in thirty minutes for a make-it-or-break-it interview or meeting and the dryer seems to be running oddly slow. Or maybe your son or daughter needs their uniform for the big game and the dryer hasn’t even come close to drying their clothes. Having your dryer working like new again is a must, whether you have a house full of munchkins who seem to need a change of clothes every hour or a laundry room piled high with the last several weeks’ worth of clothes. Our appliance repair specialists provide caring, customer-focused, same day appliance repair for our clients in Dallas. Learn more about the popular brands that we service below and more about our dryer repair on our website. Contact us now for fast same day appliance repair service that will protect your dryer’s warranty and will have your dryer back up and running like new. It’s impossible to count how many times, we all—whether we live in North Richland Hills, Saginaw, Arrington, or the heart of Dallas—have been grateful for the convenience of our microwaves. Whether it be after a long day and having the ability to eat a meal within minutes, or if it’s that big family dinner and we need something to cook fast, our microwaves are indispensable. If your microwave has recently quit working like it used to, we highly recommend that you do not attempt to DIY the repair needed. Though repairing your own appliances is admirable, repairing your microwave is difficult and can be dangerous if you don’t repair it properly. Instead, call Appliance Champion. Our appliance repair specialists have the knowledge, experience, and needed tools to repair your microwave; when we repair your appliance, you can rest assured that it is safe to use and that its manufacturer's warranty is intact. Learn more about our microwave repair or contact us for a same day appointment. Like repairing your microwave, when your dishwasher needs some tender love and care or has flooded your kitchen, it is best to call our appliance repair specialists. Most modern dishwashers that those of us in the Dallas area use, are made up of sensors and other complicated parts that can only be addressed through the use of proper tools. When you call Appliance Champion for dishwasher repair you can assume that we will fix the root of the problem and any resulting damage, we will have the proper tools to protect your manufacturer’s warranty, and can provide maintenance advice that will keep your dishwasher running for a long time as it did when it was first installed. The appliance repair specialists of Appliance Champion don’t want you to suffer piles of dirty dishes and tired, dry hands due to washing all of your dishes by hand; learn more about our dishwasher repair and contact us for a same day services. Your stove is one of the main components of your kitchen; it is where you most likely fix most of your meals whether it be a flavorful reduction or a pot of instant mac and cheese. Not having a properly working range is frustrating and can be incredibly dangerous to use—and to fix DIY-style. The appliance repair specialists at Appliance Champion offer same day appointments for stove repair to the Dallas area. We understand that having a working stove is a must whether you use it everyday or once a week; it is a convenience that you deserve to have and rely on when you need it. Our repair specialists have the experience, knowledge, and tools, to fix your stove safely and completely, while also keeping the manufacturer’s warranty intact. We offer appliance repair for all the main brands listed below. To learn more about the stove repair we offer or to schedule a same-day service, visit our website. When one of your appliances stops working you are not only confronted with the inconvenience and frustration of not having a working appliance, but you are confronted with a few, sometimes difficult decisions. Should you repair or replace? If you do replace, then who do you trust to do the job? We at Appliance Champion understand what you are going through and know that you could call anyone in the Dallas-area to fix your broken appliance—or even try to fix it yourself. For all these reasons and repercussions, we offer service backed by honesty and professionalism that you can trust. Appliance Champion offers same day repairs to our clients in the Dallas area. We do this for your safety, your convenience, and your peace of mind. We understand the frustration of not having a reliable appliance whether you use it all the time or just once a week and want to make sure that you and your family remain safe. Because we provide appliance repair for main brands, we usually have the part needed to get your appliance up and running once again. All of our appliance repair specialists are drug-tested, factory-certified, and have undergone an extensive background test. Also, our company is family-owned, insured, and bonded. Inviting a stranger into your home can feel difficult, but we do all in our power to help you have peace of mind, knowing that you have a trustworthy professional working on your appliances, backed by a company that truly cares about our customers. As we said above, we care about you. We aren’t in it to hack together a repair and get away before you are none the wiser. We intentionally build trust with our clients so that they not only trust our quotes, but can also understand the repairs we provide and why that is the best plan of action. Also, we aim to educate you about the basics of not only how your appliance works, but also how to keep your appliance in its best condition and working for a long time to come. We hope that you don’t have to call us regularly, but know that when you need us, our appliance repair specialists will be there. We are the Top Rated Local appliance repair experts for a reason. Our family-owned and operated business has been providing clients in the Dallas area, appliance repair that is reliable, priced-fairly, and consistent. Read customer reviews to see why we are the number one choice for clients in Keller, Southlake, Colleyville, Bedford, Fort Worth, and beyond. If your appliance isn’t working you are probably feeling a few things. First, you are probably frustrated that you don’t have a working fridge, stove, washing machine, etcetera. Secondly, you are probably wondering what your next step is—repair or replace—and how much that is going to cost you. Whether you should repair or replace your appliance depends on the type of appliance, brand, and specifically what is wrong with it. However, here are some general guidelines or questions that can give you direction as you decide to repair or replace your appliance. It is best to consult with your appliance repair specialist about your specific brand, model, and type of appliance to best determine if the age of your appliance should warrant its replacement. Obviously, the more you use your appliance, most likely the sooner it will need to be replaced. However, consistent and proper maintenance can increase the life of your appliance and offset wear and tear of heavier use. Again, it is best to consult an appliance repair specialist because the parts of some brands or models can have tendencies to break down sooner or the exposure to various environmental factors can play a key role in the life expectancy of an appliance. How difficult is it to replace? Some appliances are more difficult to replace than others, particularly those that are built-in. Repairing an appliance may be more cost-effective in the long-run when you consider all the additional installation costs of a new built-in appliance. What benefits will a new appliance provide that I don’t already have? Sometimes the advantages of a new appliance far outweigh those of keeping the same older appliance. For example, investing in a new energy-efficient appliance may prove to save you more money in the long run due to the cut in energy or utility costs. Also, new appliances provide advantages such as better sensors, more settings, and conveniences that fit the modern lifestyle of those living in the Dallas area. Is it broken and more expensive to repair than replace? There are some appliances that even though you would like to save them and keep them, they are more expensive to repair than to purchase and install a new appliance. Also, you must consider if your appliance is simply broken beyond repair. When Do I Call an Appliance Repair Specialist? Knowing when to call an appliance repair expert in Dallas can be difficult—you don’t want to overreact and call for a repair “for no reason,” but you also do not want to come home to a broken appliance, an electrical fire, or a flood. Though knowing when to call for repair is dependent on the appliance, here are some general guidelines to help you know when to pick up the phone and call for repair. If there is a smell that is coming from your appliance, it is likely that your appliance needs some attention. Smells that may be cause for alarm are those that smell like something such as rubber or electrical components are burning. Before you assume the worst, be sure to check for molds, mildews, and other organic materials that may indicate that your appliance just needs to be cleaned. But, if the problem persists, depending on your appliance, it may just need some professional attention. It is making a weird noise. Sometimes a “weird noise” can be, for example, the result of a penny that fell out of a pants pocket during a wash cycle. But sometimes an odd noise can be a telltale sign that your appliance needs some TLC or is in desperate need of repair. It is not running like it used to. If your appliance seems to take extra time to perform a task or insufficiently does its job, then you may need to invest in some maintenance or some appliance repair. Though when an appliance ages, it will not run as it used to, you shouldn’t have to settle for second best until the appliance has reached the end of its lifespan. It only works if you jerry-rig it. If you have to stuff a spatula in the microwave door for it to stay closed or have to construct a duct-tape or rubber band contraption to get your appliance to work, then you may need to get your appliance repaired and possibly replaced. If your washer or dishwasher, is leaking water or—god forbid—leaking another kind of substance, then it may be time to call for appliance repair before things get worse. Usually, the problem can be fixed with a part replacement. However, it is always best to call your professional appliance expert to make sure the root of the problem is fixed. If your appliance won’t turn on, obviously you need to call for appliance repair, but always make sure to check that your machine is still plugged in and the electrical circuit is on. If you have checked all of these possible explanations then it’s time to call the professionals. Our customers are important to us and we hope that every time you call Appliance Champion for appliance repair in the Dallas area, we do a job that exceeds your expectations and is worth talking about. Here are what some of our clients are saying in the Dallas area. We operate in nine unique locations in the Fort Worth, Texas area.